Here’s another restaurant in Charlotte for vegans to be thankful for – Zizi’s Awesome Vegan 2 Go. Zizi’s Holiday Dinners are well-loved for two reasons: Zizi’s food is yummy and their classic Holiday Dinners are one of the more economical vegan options at Thanksgiving. You can also order any of the menu items a la carte. The turkey is $5.99 for 5 oz; sweet potato casserole, stuffing, and green beans almondine are all $4.99 for 8 oz; mushroom gravy and cranberry sauce are both 4 oz. for $1.50; and desserts range from $1.99 to $3.99. I’m hopeful Zizi’s will be able to provide me with a photo of their Holiday Dinner. In the meantime, here’s a picture of one of their cheesecakes … unfortunately it’s not the Pumpkin Cheesecake, but it should give you some sense of how delicious the food is. 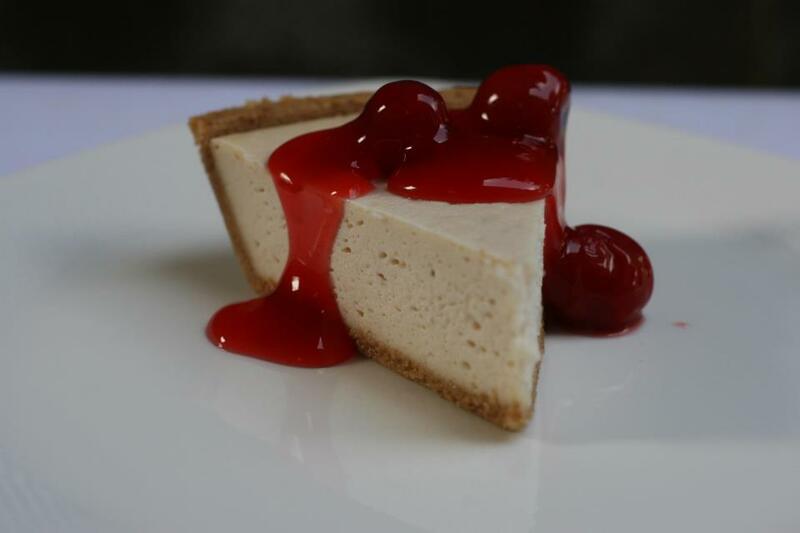 Vegan Cherry Cheesecake. Photo Credit: Zizi’s. 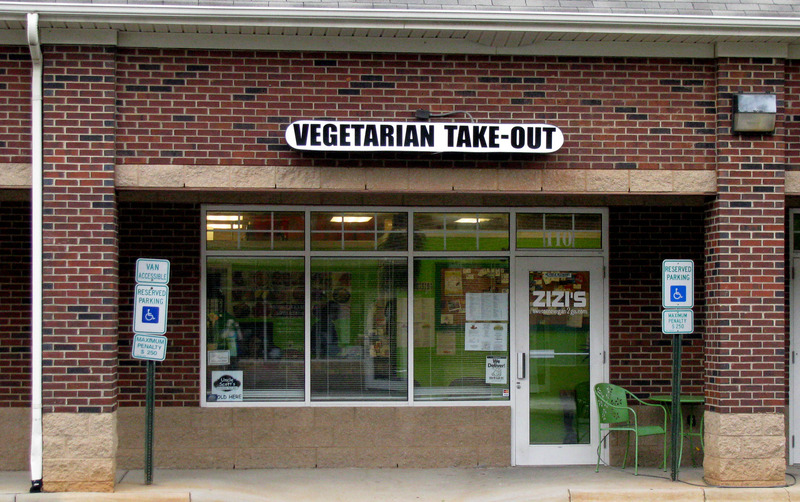 Although the sign says, “Vegetarian Take-Out,” Zizi’s is 100% vegan. It’s dine-in only, one reason they’re able to keep their prices so low. Call 704-595-9170 to place an order. And check out this full review of Zizi’s Awesome Vegan 2 Go. While I think not cooking for Thanksgiving is against the holiday rules haha this looks like a great option for vegans wanting to truly enjoy the holiday spirit! Yes, I agree and plan to cook but I think it’s great there are options for those who don’t now how or what to cook! It is also a great option for those of us without time to cook. My job is open 365 and I already know I have to work a 14 hour shift on Thanksgiving so I love that I can pick up a traditional vegan Thanksgiving meal to make the day slightly less painful. I actually live down the street from Zizi’s so I think I will be placing my holiday order asap! Also thank you for doing all the research and posting holiday vegan meal options. I know it must be time consuming but I greatly appreciate it. Awww, thank you! If I can help make someone’s vegan journey easier it’s worth it! 14 hours on Thanksgiving is rough! You’re fortunate to live close to Zizi’s. I don’t get by there nearly as much as I’d like to. Be sure to sign up on Zizi’s website for their emails – they run a lot of specials. Wow another great option! I haven’t been to this one either. It’s great but takeout only. Definitely pick up some sandwiches from there the next time you’re in Charlotte, or try their General Tso’s “chicken” if they have that as one of their weekend specials. VegCharlotte - Living Vegan in Charlotte, NC by www.VegCharlotteNC.com is licensed under a Creative Commons Attribution-NonCommercial-NoDerivatives 4.0 International License.